Club Penguin Cheats by Mimo777 Club Penguin Cheats by Mimo777: Club Penguin Rain Update! But, he did say Club Penguin has some surprises planned for next week and he will give us more details soon! Woot! I love hearing details about surprises, don't you? Besides Card Jitsu Water, what other surprises, do you think there will be? Awesome, but I wanted to tell you about the new music in "Beans" Its so cool. Just letting you know! Subcribe to Legoguy28cp on youtube! I doubt it, but maybe another water party? I also know another glitch! Walk to the your box dimension in yur own igloo, but before your penguin enters the box world, click "edit igloo" on the bottom right. You should then be in the box world, but none of the penguins will have names. Aslo, you won't be able to see what anyone else (including you) says. You have to log out to get rid of the glitch. It's pretty phunnie! Water Party! Bring on the WATER PARTY! COME ON! Im not here to talk about this topic but what i want to say is did you inspire sleddeboy? if you do can you inspire my website? how did they get those umbrellas? Mimo!!! I Think because of the rain and since most of club penguin has snow on the ground that Card jitsu Ice could come because snow freezes water so that equals ice!!! i love it! mimo i have proof this time there was a flood in club penguin!
" The island has been underwater a few times like-completely under." thats the best proof i have right now! Hopefully it will snow for Christmas time on Club Penguin during December. That would be awesome! And also, I am not sure of what the surprise will be. It might have something to do with all the rain/water CP is getting. xP Yea It's raining, but its sooo fake. I mean, the snow would have been melting! seriously! Water party, duh! It's gonna be big this year, I bet! 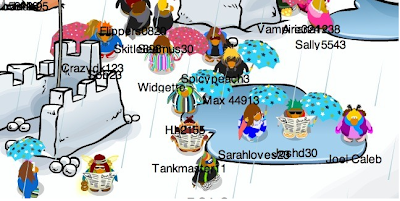 What with the: raincoats, rain for first time ever, umbrellas and floods; Is that ONLY for Card-Jitsu Water? I think NOT! Remember the volcano. Fire jitsu. Rain. Water jitsu. Rain coats umbrellas and the lot, water party! I reckon that Sensei will ask us to go on a 'water hunt' like last years 'fire hunt' and the prize will be a water pin. whoo hoo. water party coming soon. I hope the water party does come back! It's so fun! I have found a really cool cheat!! If you earn all the stamps on carty surfer, you get double coins every time you play!! so lets say you get 300 points in the game, you will atually get 600 coins!! its so cool! I'm earning so much now! Mimo, remember the Rainy Day Background, what`s Members-Only!? omg! the newspapers in the penguins' hands in the pic are getting wet! Did you know the member rain background can be be bought by nonmembers now? winter luau party or water party? Hi I found a new dance! put all the tactical clothes of EPF and dance he will do a somersault. I think its very cool! hey mimo, i found something cool if you go to the ninja hideout and you kmow its raining there right but one of the big puddle is right on the water sign on the floor. i love your website that isn't a week behind all the gossip !! Yea, I noticed that! It's weird. whispers to self Good, i'm not the only one... lolz. It's really hard to get a comment posted by them isn't it? I guess it's because there's so many comments that get sent in for them to check. Here's a tip, if you see a post JUST posted, try sending in a comment then. I got a comment posted one time cause of that. A lot of Club Penguin glitches have been going on, huh? I wonder when they'll get fixed. lol. Now would be the perfect time to make a video of a song that's called that. Sorry, I don't think i've heard it. Heard of it, havn't heard it. I don't know, maybe I have. That would be cool! Maybe the rain storm will get worse and flood Club Penguin after 2 weeks. Then we could have a Water Party! Oh! I know that glitch! It's one of my favorites. And you don't have to log out and back in to get rid of it. You just go back to your igloo and click ''Edit Igloo'' and then click it again. Everything should turn back to normal. Umbrellas are currently being sold in the Gift Shop catalog. And there's one special one you can unlock from the latest Treasure Books. Yea, that would be cool. But there's too much proof that Card Jitsu Water will be coming out soon. The Card Jitsu Water cards are already being sold in stores. I think Card Jitsu snow will be next year. Yea, it has flooded. That's why we had the Water Party. A crab cracked the Underground Pool's glass window. I think more signs of Card Jitsu Water! Sensei will probably be announcing it soon. We might even be able to build the Water Dojo like we did the Fire Dojo! I hope so! I loved the Fire Hunt last year. I also loved the pin very much. Yea, that's what happens when you get the stamps for every game it allows you to get stamps on! It's so cool! That's good to know. Thanks for telling us! Did you know that if you click on dance contest fast and then it says "Hold Up! Connection has epic failed! ( Insert Instructions )"
Hey mimo if you play hydro hopper and you look at the sky, dark clouds start to appear!!!!!!! !CHECK IT OUT! Good spotting, but they were already there. OMG mimo. I found another glitch for the Dance off game! If you play the game when Cadence asks you what song you want to play the all say "Penguin Band Boogie". To do this glitch you first have to press the left or right arrow. Check out this glitch. Hey Mimo, did u saw that right now, the members only background is now free to buy for all penguins. Do you think that everytime a new background comes out, members are the first who have the wright to wear it? Mimo I just went shopping at the Disney Store at the Square One Mall and they had giant Club Penguin Plush toys. And on their foot it says "Club Penguin Disney Store" instead of just "Club Penguin"
Well, it's not that obvious. We don't know what the Club Penguin Team is cooking up. lol. But that is a good theory! A giant gerbil is going to attack Club Penguin! Sign of the water party because they're might be a F-L-O-O-D. The rain has somthing to do with Card Jitsu Water. If you go to ninja hide out the water thing has water all over it..
its may be a sign of card jitsu water! Really? Thanks for letting Mimo knowing that! What if it was called "Singing in the Shower!" Or do penguin's really take showers? lol! Not much of Winter Luau party, but probably a water party, most likely Card-Jistu Water(Card-Jistu Water Tin? It's already out). But still, good thinking! how about the water party just think rain/water card jitsu so its just gotta be. Yeah, most likely. I have seen other pictures about the Water Dojo. It's very strange. Let's see if you're right. It's really difficult for the CP Team to post your comment, they get HUNDREDS of comments. I've tried a lot to get my comments posted, also. P.S. What did you comment? That's a really sweet idea! There are alot of crazed Mimo fans! Everyone is so excited! Ninjas Definetly need a new challenge! Did you see that the Ice/Snow symbol is there too! No there is a drought. Hehe!! The Sand Dojo is coming out! Legoguy28 is right! There's new music for the Bean Counters game! Wow the Water Dojo sounds like it is going to be cool! Maybe we will be underwater when were playing Water Card Jitsu! Good thing it's not raining inside. No one wants soggy puffles! rainy day background available for everyone now mimo. He said he was just kidding. you get the umbrellas at the gift shop for members you can get a blue one and a pink one. mimo! the volcano, raining but if u look at the ninjas ninja emblem, it has fire, water and snow!!! soon it may be snowing like wild! They are? I never knew! dunno if anyone already posted this but doesn't rain wash away snow? i am starting to think that theres gonna be no more snow. Off the topic but when is mimo's party? Mimo! Check the newspaper! on page C5 the stamp section,the stamp book has the G Billy stamp on it! Could the Penguin Band be coming soon? This is a weird glitch. Sometimes when you go to large member igloos, you get a flash of the igloo without anything in it, then the loading furniture bar comes up, and u see the furniture. It's really weird. Try it! Sorry, off subject. Guess what... I got over 200 coins digging in the "chocolate pudding!" One time I got a 100 coins bag! Hey, Coaley24! Sorry, but this has been there always. But anyways, great spotting! MIMO!!!! I have some NEW CHEAT!!!!! Now in Club Penguin NON-MEMBERS can buy RAINY DAY BACKGROUND!!! I thinked i help you!!! Thank you for letting Mimo know! I'm glad it was just a glitch! Hey mimo, theres a warning slippery floor sign at the Beacon. My name is Speed104. I know, it has something to do with Card-Jitsu water, and also, when I talk to fire sensei it flashes the mermaid lair. Hopefully there will be a flood in the whole Club Penguin lol. And the music has changed for the bean counter game in the coffee shop. guys did ye notice the rain isnt a very cool thing.ok first thing,go to the fire dojo by the ninja courtyard[note.do not read this if your not a ninja or members].In the fire dojo the flames are gone!!! when i read the toys R us ad i saw water cardjistu cards in one of the speacils of the week.If you check the online ad you should see it! i think because we had hot in summer rain in autum and probly snow in winter for card jitsu snow? kl huh? Hey Mimo! Check out the epf command screen!It doesnt have the click thing its just animated.and it looks darker in the epf! Mimo forgot to add this but I think it just changed because when I first got there it was all dark and the screenwas like zeroing in on something1 but now I just wenrt back and its light and its back to its regular version! Maybe since the newspaper is getting a change one of the surprises will be that park picture from the Club penguin guide book where it had the fish fountain, the what's new board and the park thing. I bet they put it there so penguins wont slip off the beacon! The Bean Counters music changed. Just letting you know, it sounds pretty cool actually, im going to miss the old music. yo mimo just like u to know that when i was playing card jitsu i herd this water fighting or its just the rain but im pretty sure i could here robes and BIG WATER BOMBS OR SOMTHING!! I know this off topic, and its being long since i posted comments. But Bean Counters has a new music! To hear it, you need to clear your cache.. I know this is off topic. But they updated Bean Counters with music. There is a very good reason for that. Have you noticed that when you first log in and get on the server there are no penguins there either? That box is grouping of all the penguin names in the room. For some reason that has what has been happening on Club Penguin these last few weeks. I hope this helped you. wow mimo! i found the weirdest glitch ever. if you go send a postcard to somebody, then go on the page of postcards to send and then go on page seven if u look at the one that says tip the berg for ten seconds, youll see little black things moving on to it. hope this helps you! Hey Mimo u know how the valcanoe is the place for fire jitsu? well i have a theory that if u go to the dojo u c the waterfall and the huge mountian (top right hand corner) what if the waterfall is the place for Card jitsu water and the mountain for ice jitsu! Hey Mimo, the music for Bean Counters has not changed for me. My name is Speed104. Mimo,for the ninja room, I think the Water Jistu is in the staircase. did you notice that when you open the doors it's raining outside? cool eh? Anonymus you can get umberllas from the gift shopnbut you have to be a member.